We aim to stock quality redwood pine decking imported from Sweden in a range of lengths to suit your needs. 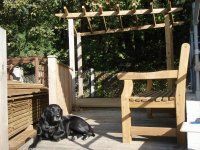 We also stock deck panels, spindles and balustrade for your decking area. Please remember we do offer a delivery service for your convenience recognising that this product can be awkward to transport. Please call us on 01256 841199 to discuss your requirements.